KUROKO NO BASUKE COLORFUL COLLECTION IS UP!!! Hey hey... haha I saw your comment all the way in the land of rising sun! Can I have Kuroko with Nigo, Kuroko, Kise and Aomine? Keke... thanks! LOL, how is it overthere? Having a blast?! Did you see the cherry blossoms before the storm blew it all away yesterday? I miss it so much, I have to really plan a trip in a year or two!! Anyways, I'll put those four little guys down for you!!! I'm back in Singapore already. Wi-fi was horrible in Tokyo =.= I couldn't really reply to you. I managed to see the Sakuras in Ueno and Tokyo Station area. They were really pretty! Been 'molested' by Mickey Mouse when I was at Disneyland too haha and managed to get some Fuji items as well. Nakano Broadway has so much treasures there! Welcome back miss Fuji!! No problem with the replies, glad you got to see the cherry blossoms!!! I heard there was a storm after you left, so I was worried that it had blown away all the lovely petals~ I'll be going to San Francisco tomorrow and will go see the Cherry Blossom Festival in Little Tokyo, that's as close as I can get to the familiar Japanese experience at this time hahaha =P Hopefully there will be something nostalgic!! Well well, molestation on the packed trains is a common occurrence, but molestation by Mickey Mouse is the first I've heard hahaha~ It was still spring break when you went, was it really crowded at Disneyland? Nakano Broadway!!! The massive shopping center for tourists and otakus haha, what Fuji Aniki stuff did you get?!?! Do tell do tell!!! Two check-ins AND four carry-on's?!?!?! You sure went all out on the shopping didn't you?!?! Hahaha that's great, I would've done the same =P Glad you had a good time~ It sounds awesome!! I managed to get some cards and bromides which I was looking for. Plus the agent I always go to for my auction items also sent me stuff to me so as to save some shipping cost for me haha. I spent a lot at Disneyland mainly, the snacks, accessories and bags haha. Even got myself a Shellie May Bear from Disney Sea =.= Plus shopping at Samantha Thavasa too. I also bought 15 mangas (erm BL one haha) but mainly was the food and Disney stuff that's taking up the space. Oh that's nice! I wish we get cherry blossoms here in Singapore. Haha the only Purikura I've taken was erm... Disney related too haha. Yes lots of shopping at Disney, I'm a huge Mickey Mouse fan haha. I bought this really nice glass figurines of baby Mickey and Minnie and it was like 91 SGD.... I figured since I'm not going Tokyo for a long time, why not? Which BL title do you read? Well I am a fan of Okane Ga Nai and Crimson Spell that's why I went to grab the whole series from Animate when I was at Akiba =.= I'm just thankful my luggage wasn't overweight when I came back to Singapore. Hi Azi, just letting you know that your Hyuuga Karakore is here!!! Should I add it to your second package and give you a new total for that? Omg all of these things ahhhh!!! Also, if they're still available, I would like a Kagami and Aomine one coin figure too. Hi deadmans_q, just letting you know that your Kagami Karakore is here!! Is there anything you would like to add or should I give you a total? Great! Do you have an extra Aomine Karakore, by chance? Although the Kise karekore is really cute, I can't spend too much money at the moment. 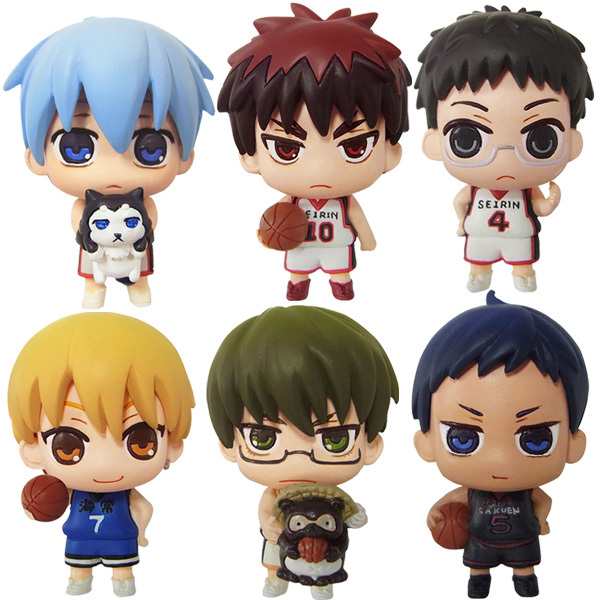 :( Could I just take the Aomine and Kagami? Same address as before. I have received your payment! Will send your package on Monday =) Please keep an eye out for the shipping confirmation with the tracking number, and please leave me a feedback on my feedback page to let me know when you received them as always! !